Work chaos is the fiend that plagues enterprise teams. It emerges as a result of serious work mismanagement and it can take many forms. Work chaos can be caused by a lot of things, including: random input processes, disconnected activities and poor visibility into work and resources. 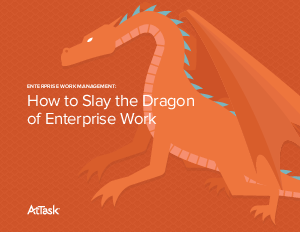 By slaying the dragon of enterprise work you will be able to simplify your processes, connect team members to their work and each other, save time, money, and more. "All you really need is to know who's working on what, if people are working on the right work, do they have the resources they need, and will work be completed on time. But every time you try, you end up getting burned by the dragon."